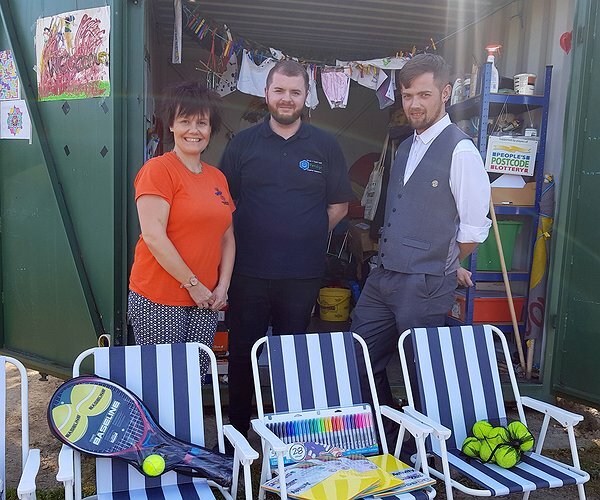 A maintenance team have donated £100 worth of items to a community play scheme where they have also carried out more than three quarters of a million pounds worth of housing improvement work in the last two years. PenAlyn, the in-house maintenance team that looks after Clwyd Alyn Housing Association homes in Oldford, Welshpool, have provided 40 new boilers, 159 bathroom upgrades and 87 kitchens since April 2016 and as gesture to the great community spirit in the area they recently also donated items to the Oldford Pod Play Project. “Throughout our housing improvement work on the Oldford Estate homes we’ve been able to see first-hand the great work that the Oldford Pod Play Project provides and we wanted to make a contribution to help them along,” said Tom Bishop, Resident Liaison Officer with PenAlyn. “The play scheme is a local registered charity, run by Play Montgomeryshire which runs annually from April to October providing two hour outdoor play sessions twice a week. “It’s great that this is run free of charge for local children to be able to express themselves through the medium of play and we were very happy to help out,” added Tom.